Yorke Peninsula farmer Mark Schilling runs the Cunliffe bait station. Mouse bait mixing stations are helping Yorke Peninsula farmers in South Australia control mice numbers. At the start of the season, farmers were planting grain crops in paddocks that had been inundated with mice. The mice can eat the seeds farmers sow, as well as newly-germinated crops. 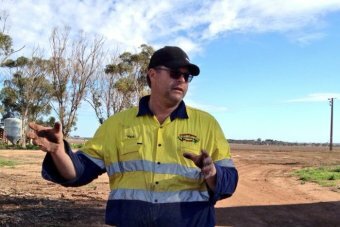 Grain growers have spent tens of thousands of dollars on bait to try to kill off the mice and keep their crops safe. Now new baiting stations, where poison and grain are mixed together on the farm, are making that process cheaper. Maitland farmer Dylan Schultz has spent a lot of time spreading bait in his paddocks. “We’ve baited some paddocks three times,” he said. “They only need to eat one (poisoned) grain. One grain is lethal to a mouse. “But it’s been shown that a mouse can actually eat 20 grains before they die. Cunliffe farmer Mark Schilling has a mouse bait mixing station on his farm. The station is a shed, where the process of mixing poison and grain can take place. The stations have to be approved by a number of regulatory bodies before they can go ahead. Mr Schilling says it would have been better if the stations had been opened earlier, but it’s a relief the cheaper bait is finally available. “If you came and saw me a month ago, there were mice everywhere. They’ve quietened right down now.